Naturally hypoallergenic and chemical-free, this luxurious mattress tends to your comfort with eco-friendly know-how. 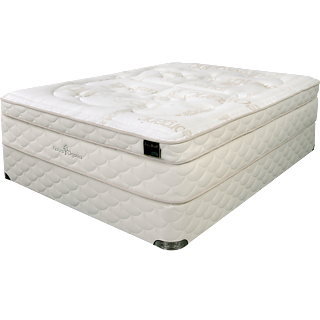 The EcoSanctuary Ultra Plush Mattress cradles you in the gentle comfort of extra soft Talalay latex and other health wholesome components. The extra plush Talalay latex layer gently cradles your unique curves to ease stress and strain from tired muscles. The all-natural Dunlop core made of USDA certified organically grown latex equalizes pressure and targets support where its needed for delicious comfort. Certified 100% organic Natura Grow WoolTM wicks away moisture to create a dry, temperature regulated sleep haven while it eliminates harmful bacteria, dust-mites and other sleep disturbing allergens. Dressed with a deliciously soft, 100% certified organic cotton stretch knit ticking, this organic plush latex mattress offers you a healthful organic haven to rest and rejuvenate.